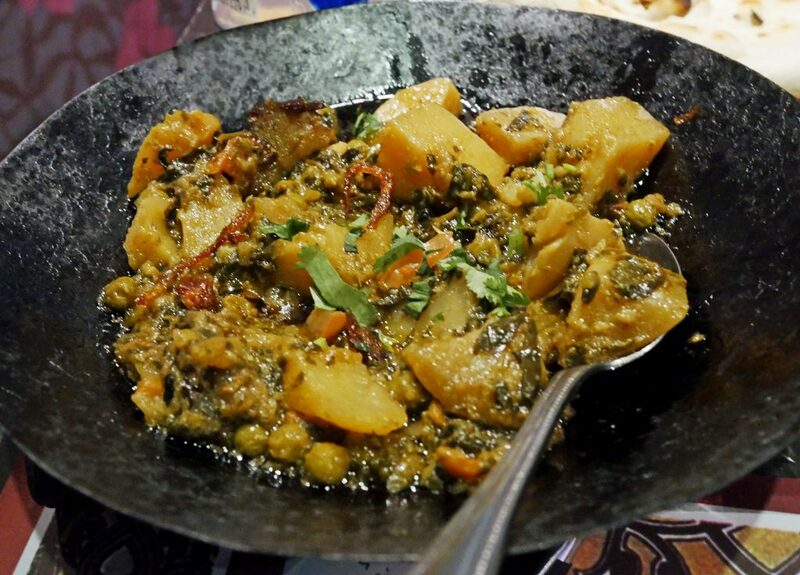 A progressive meal and walking tour ‘Flavours of India and Beyond’ exploring Brick Lane and Whitechapel sounded fascinating. 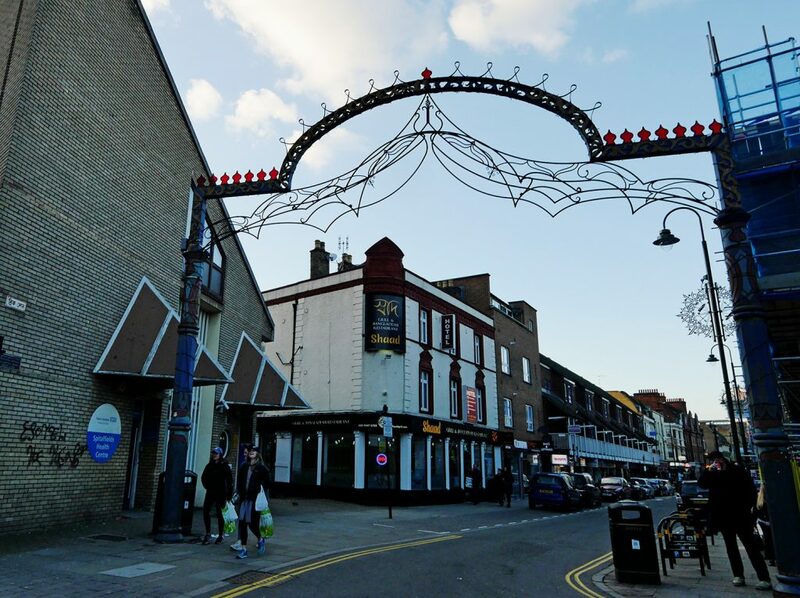 Of course, I’ve dipped in and out of the area, but I’ve never really focused on what this area is perhaps best known for, the Indian and Bangladeshi food. 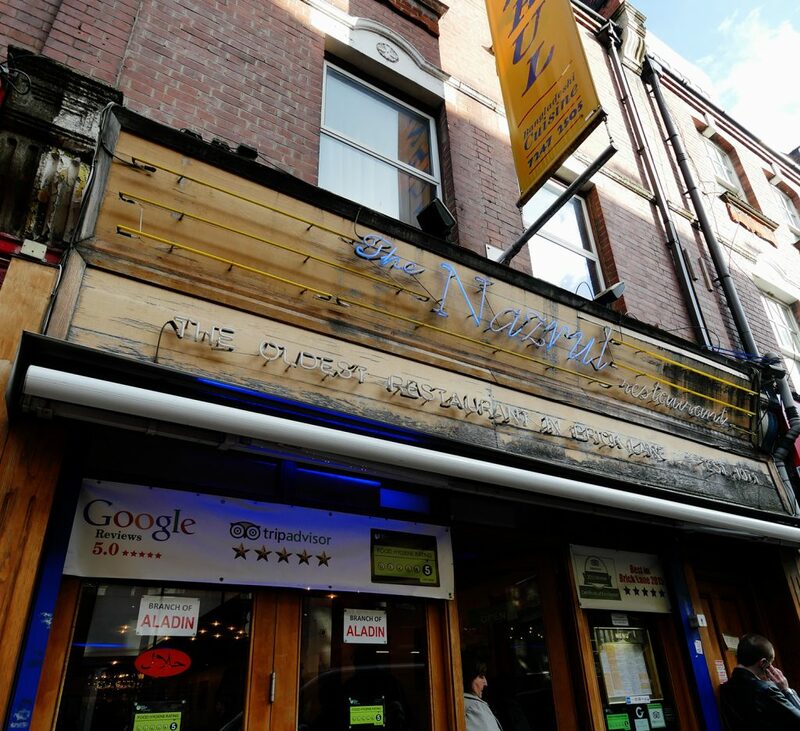 Meeting at Nazrul, the oldest of a group of four Bangladeshi restaurants (the others are Aladdin, Jasmine and Cinnamon), we enjoyed Cobra beer, pappadums and pickles while our guide Priya Bhamrah told us a bit more about how Brick Lane came to be so well known for Curry. The Northern part of the Indian continent is one which has been rife with trouble over the last 70 years or so. What is known as ‘Partition’ happened in 1947 and was something of a whirlwind division of what had been India into three Countries based on faith – Hindu and Muslim – India and Pakistan. The Sylhet community is one small town situated in what ultimately became East Bangladesh. Some of the people came here when they were working for the British and East India Trading company as crew onboard the trading ships. And, at the time of Partition, more of the people fled to London where there was plenty of work at the time, rebuilding the East End which had been heavily bombed during the second world war. Finally, the civil war in the 1970s which reshaped the boundaries of Pakistan and India again creating Bangladesh resulted in yet more immigrants. More and more people from the Bangladesh region moved to London, into an area which had a history of multiculturalism. 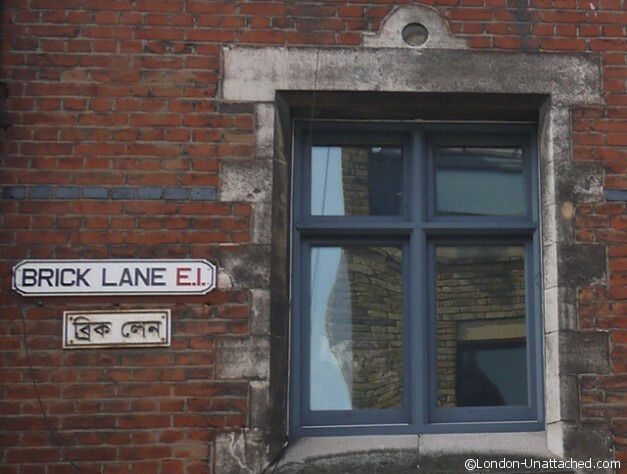 Brick Lane and the surrounding part of East London had seen a Huegonot community replaced by Irish, replaced by Jewish. And then, what became known as the Bangla community. It wasn’t always a smooth transition. 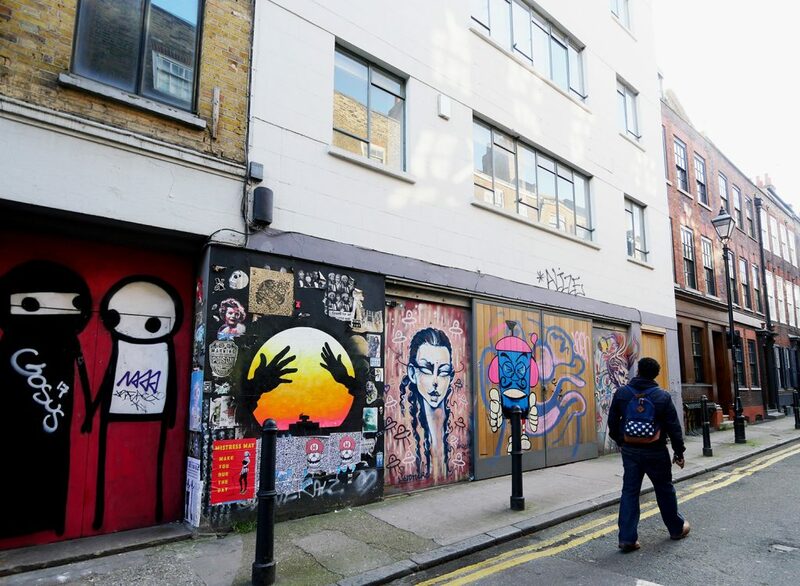 We stopped to look at one of the most famous works of street art on Brick Lane by Stik and learnt that it had been created as part of an ongoing campaign in the area to resist racism. Everything came to a head in 1978 when the murder of 25-year-old Altab Ali resulted in demonstrations and riots to resist an influx of National Front to the area. We moved on to Taj stores, founded in 1936 and the oldest Bangladeshi store in the UK – an Aladdin’s Cave of Indian foods and spices. Fresh fruits and vegetables – both mysterious and commonplace, every spice and seasoning known to man, fresh meat and some massive freezers stacked with seafood from the Indian Ocean. There was a fresh meat counter. And rice. Enough rice to feed a family for this life and the next. 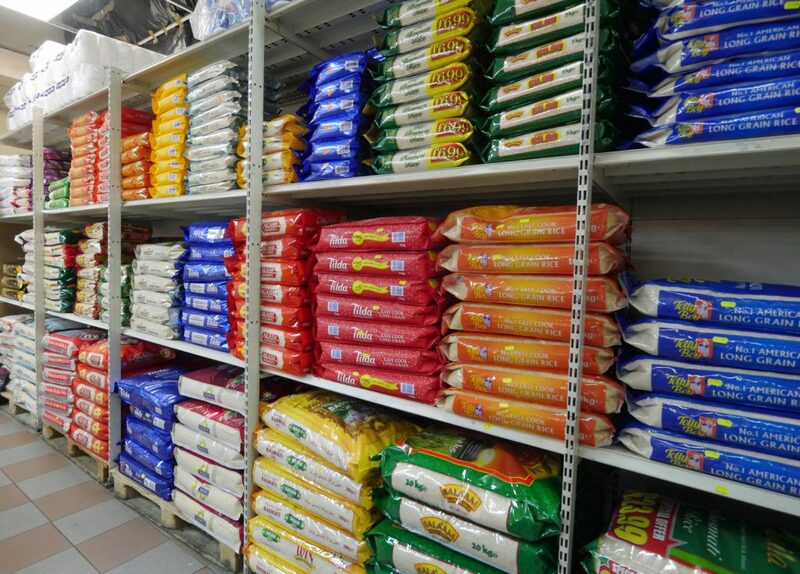 It was founded by Abdul Jabbar in 1938, a Bangladeshi rag trade employee who married an Irish lady and opened the store to ensure that all the foods he grew up with were available. It’s still run by his three nephews today. There we were given a mysterious grubby brown pod. What is it? Priya asked. Well, gentle reader, despite writing about food and knowing that tamarind is an integral part of the cuisine of this region, I didn’t know. 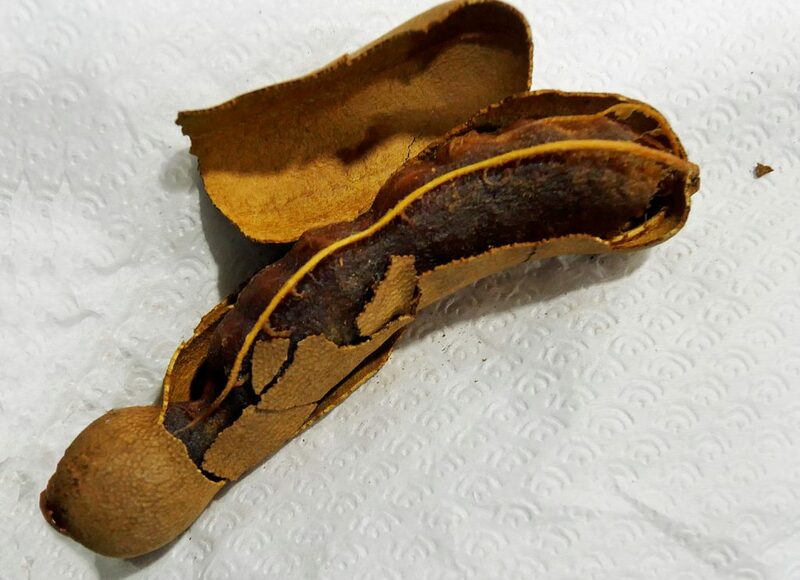 It turned out to be tamarind – the open pod revealed a sweet-sour row of sticky seeds which we sucked on to extract the deliciousness. 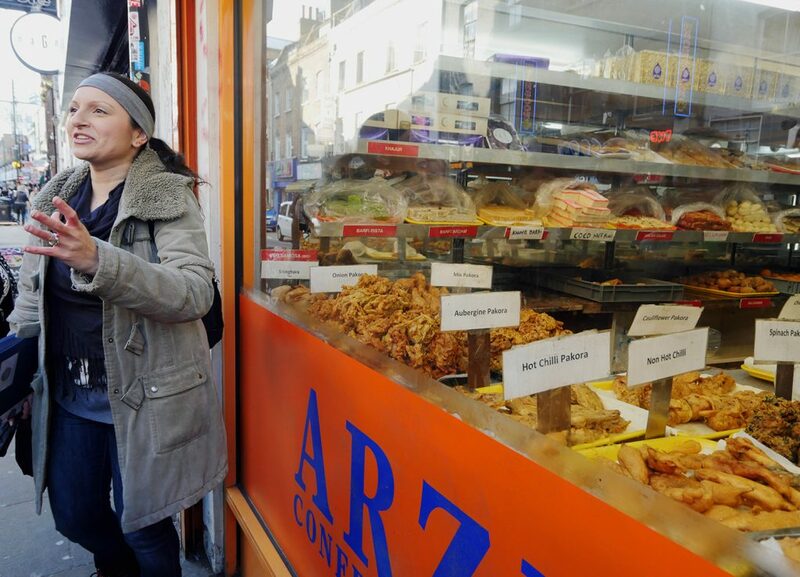 Back on Brick Lane, we stopped outside Arzu, a traditional Telebhaja shop where we learnt that the owner makes all his own snacks. 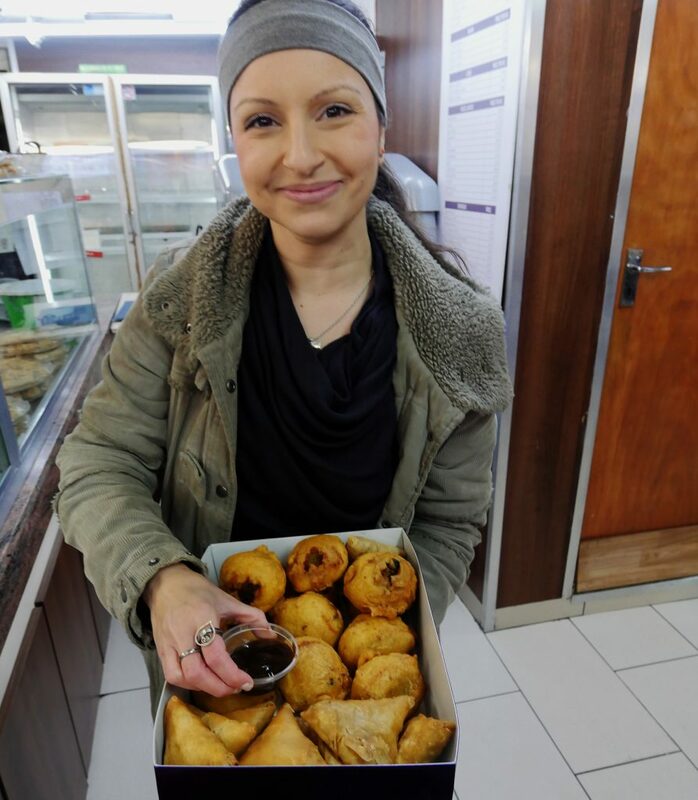 We feasted on a delicious chicken samosa and a kind of spicy potato cake called aloo chops before moving next door to choose sweets for later. A bit of a tough call really, to be asked to pick just one from the bewildering array of delicious goodies on display at Rajmahal Sweets. 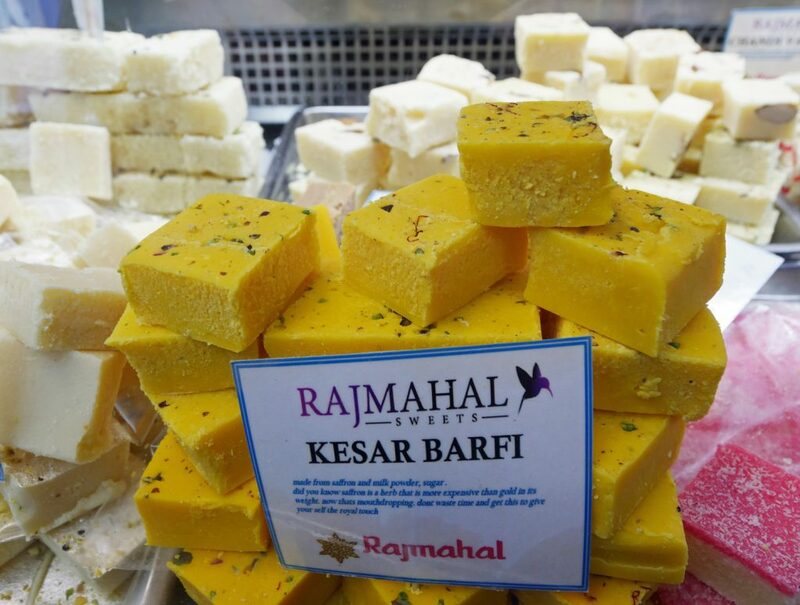 I ended up choosing a piece of saffron barfi. We were so lucky on this walking tour in February. It was warm all afternoon and we stopped to take a look at another famous piece of street art. It’s the first time I’ve actually seen this particular work in the sun. There’s a lovely story behind this particular work – that Belgian artist Roa was trying to create something quintessentially English – and decided on a Heron. 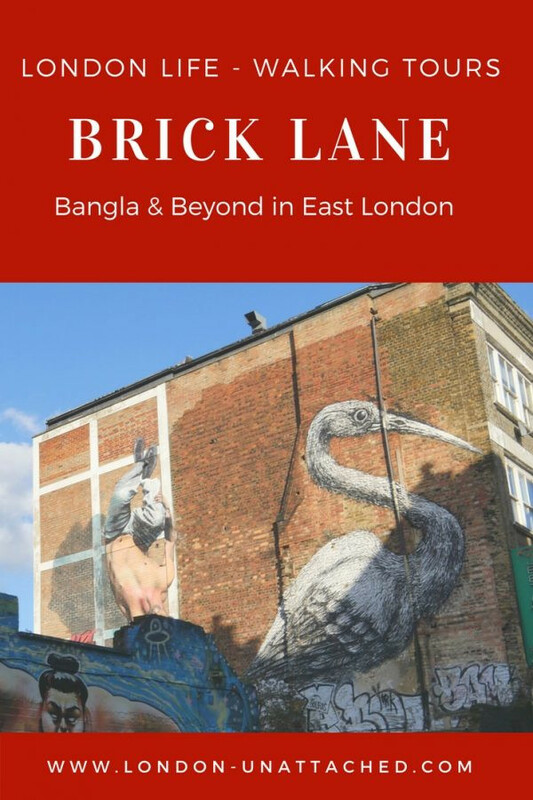 But, as he was working, one of the restaurant staff from a nearby Curry House came out and exclaimed how delighted he was to see the Bengali Sacred Crane on the wall in what is known as Banglatown – that part of East London now largely populated by people from Bangladesh. The artist was so taken by the enthusiasm of the local guy that he turned the heron into a crane. And, it’s still there today for all to see – a symbol of the Bangla community in east London. Back to the main part of Brick Lane, Priya took us into a tiny cafe that I’d never noticed before, Gram Bangla. This, she explained, is where the local restaurant workers come for their own food. It doesn’t serve or allow alcohol – instead, we were offered a deliciously smooth rich mango lassi. And, most of the food is vegetarian or freshwater fish. 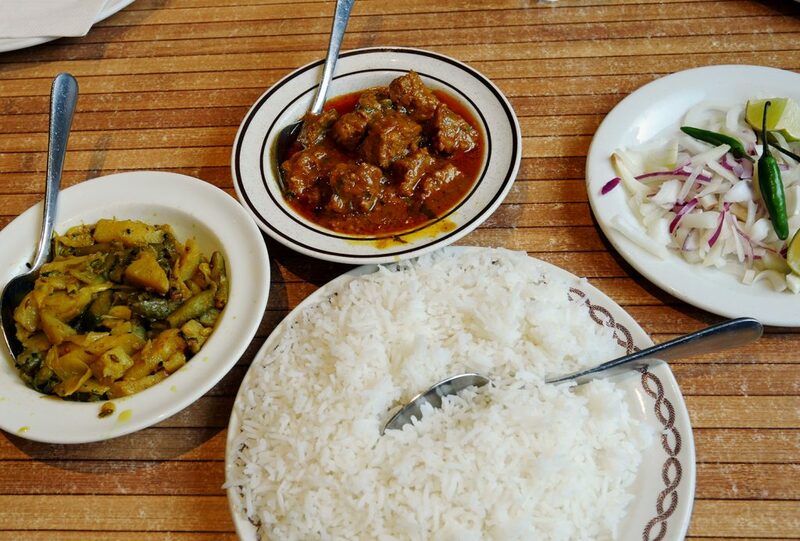 We feasted on curried tilapia with potatoes, fragrant fish koftas made from chital and rice. I don’t think any of us tried eating Bengali style with our hands…but I guess we really should have done for an authentic experience. 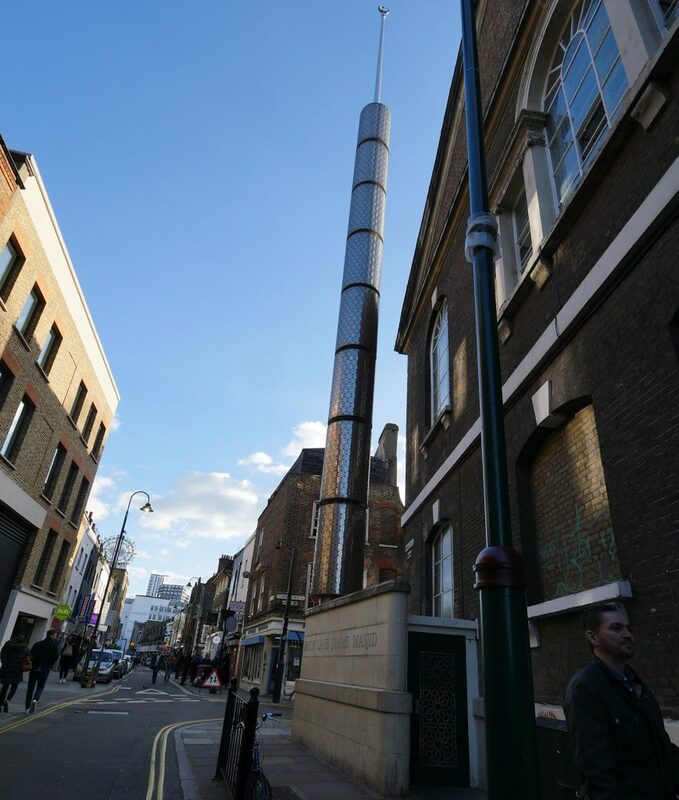 Apparently, the arches at either end of Brick Lane and the stunning painted lamp posts are gifts to the community from Tower Hamlets. They do lend a strong sense of belonging to this unique part of London where the street signs are in English and Bangladeshi and Mosque Jamme Masjid was originally built in 1743 as a Protestant chapel, then a synagogue before becoming a mosque in the 1970s. 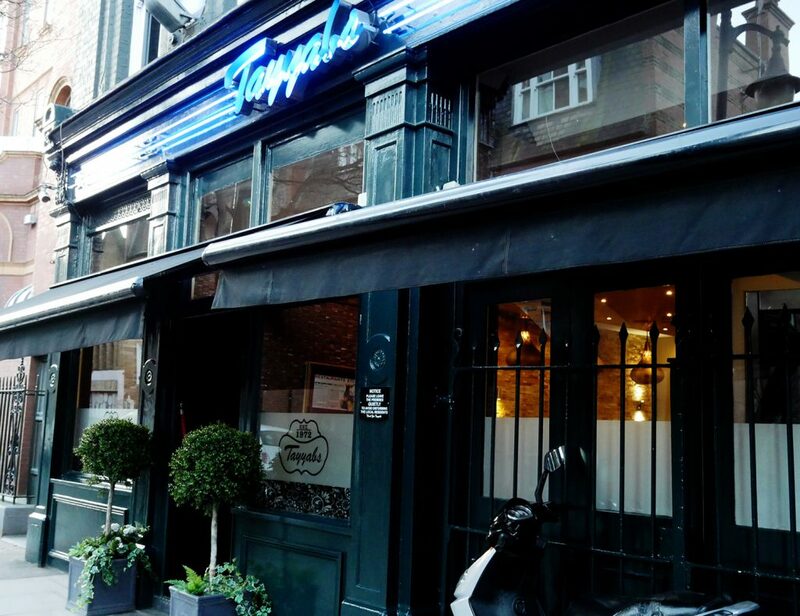 Moving on to our final stop, Tayyabs is actually a Pakistani restaurant. The founder, Mohammed Tayyab moved to London in 1964, leaving his wife and three daughters behind in Pakistan. His mother taught him how to cook before he left – and as a result, he became very popular in the house that he shared where he cooked traditional Punjabi food one day of the week to feed himself while working in the garment trade. Eventually, he branched out into making breakfasts for his co-workers. Tea and toast. But he made himself curries for lunch – and gradually his breakfast customers became lunch and dinner customers and Tayyabs was born. 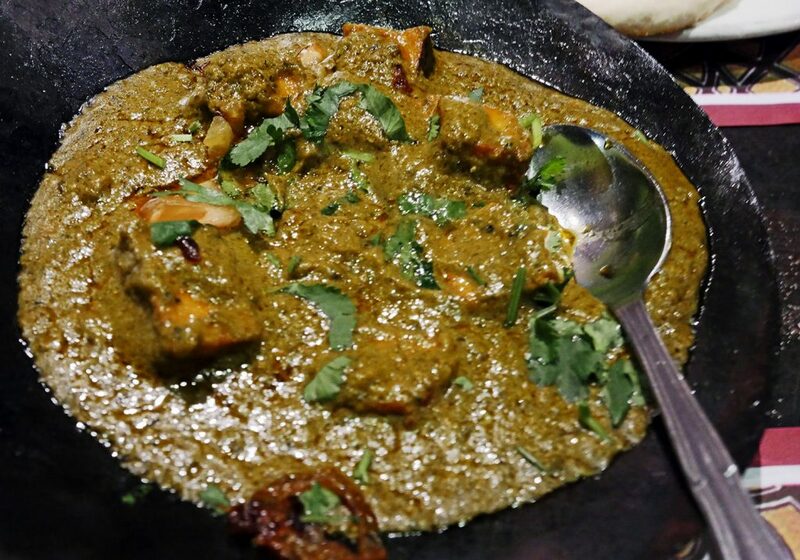 We enjoyed metal platters of Saag Paneer, Karahi Dahl Gosht and more with soft, puffy naan to wipe it all up. To finish up, all those sweets we’d picked earlier on in the day. 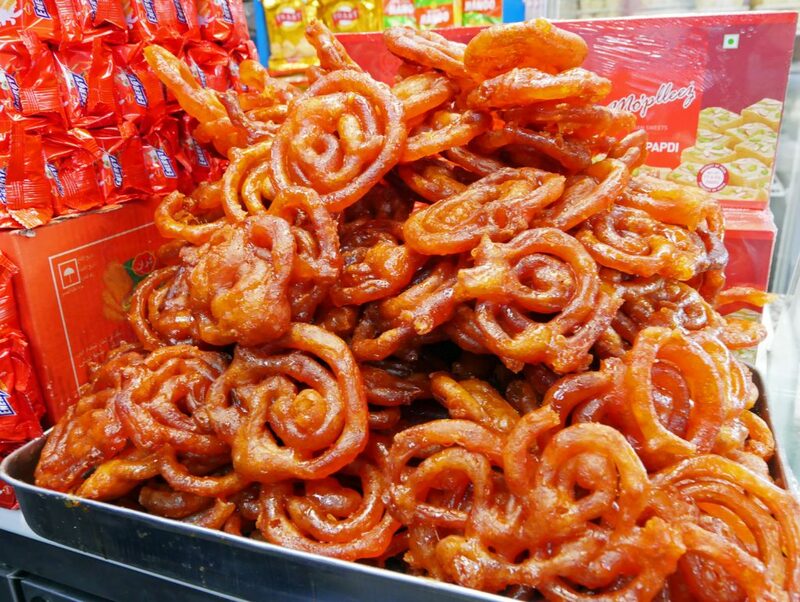 This is definitely a tour to take if you want to learn more about Indian, Pakistani and Bangladeshi culture and food. And, you’ll leave feeling very full indeed, so make no plans to eat for the rest of the day. Eating Europe run a series of different walking tours in London and Europe. I’ve already been on the Prague tour and on Eating East London some years ago. And I recommend them all – once you’ve done one you’ll be keen to check another out – after all, where else can you learn so much and eat so well both at the same time!! This is such an informative post! I did not know that so much history were in these shops. 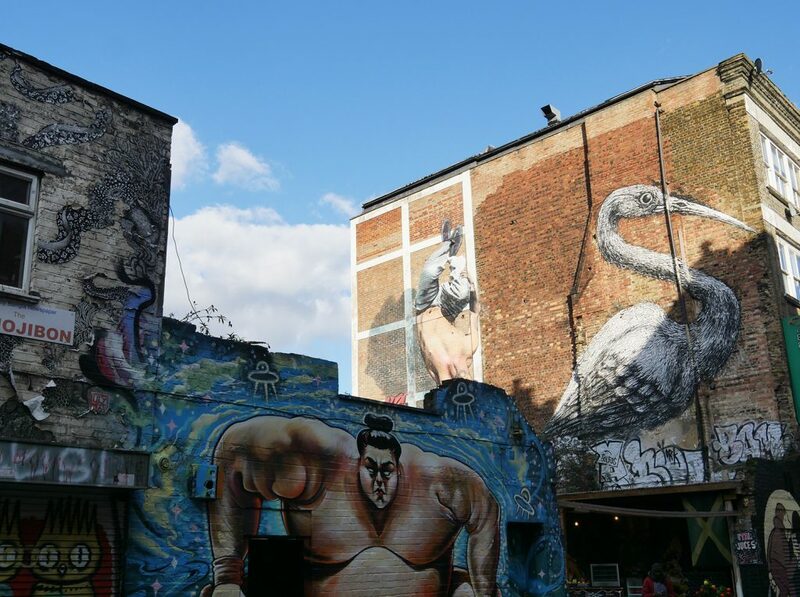 I would love to stop by Brick Lane on my next visit to London to sample some of the lovely food served there. 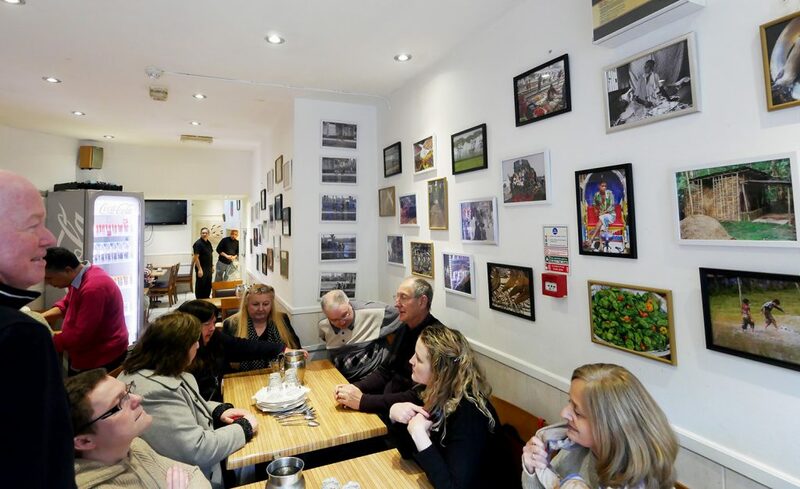 It’s an excellent walking tour – and you get your money’s worth as you really don’t need to eat for the rest of the day!